How do Scramble BJJ gis fit? Over the years, we at Scramble have refined the fit of our jiu jitsu gis based on our own experience and customer feedback. I’m going to level with you – I am an A2, therefore the most refined gi we have is the A2 size. It’s always the sample that gets most thoroughly tested from the factory as I wear it in training for weeks before production. Overall, Scramble gis are considered a slim or athletic cut. We have narrowed the arms and legs slightly and the body is not too wide. This is especially true in size A0, A1 and A2. In size A3 and A4, the fit is slightly more generous. This is because we sell proportionally less of these sizes, therefore have less of a pool of feedback to draw from, and as BJJ players get taller they generally tend to be much bigger built as well, meaning we did not have to taper the fit too much. These are the measurements (when laid flat) of key parts of our BJJ gis. If you want to get the perfect sized jiu jitsu gi you have a couple of options. First, you should analyse the size charts above. If you are still unsure, then you can contact our customer service through email or social media. The other option is to lay your existing favourite gi out flat and compare the measurements with those of our gis above. This should help you find a good-fitting gi. 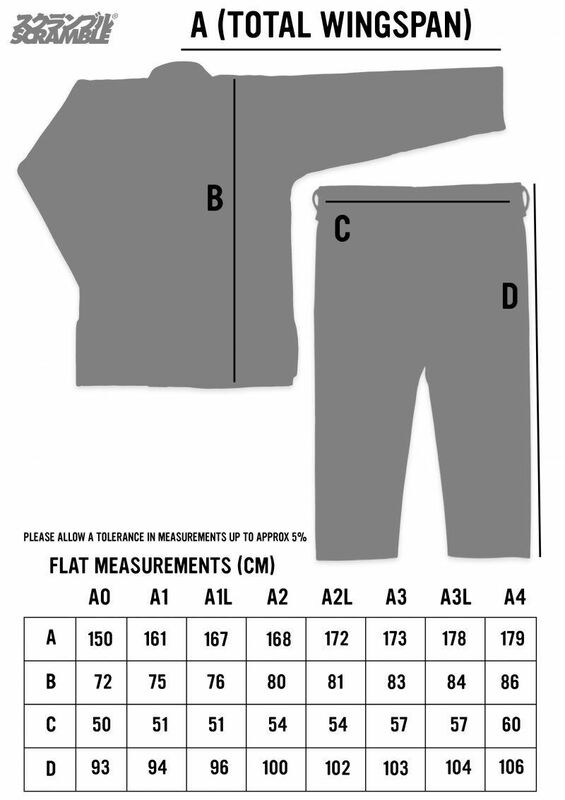 Our “L” sizes work as follows. An A2L gi is the same width in the body and waist as an A2, but has sleeve length and pants length equivalent to the next size up. So basically with the L sizes, the sleeves and pants increase in length but everything else stays the same. This is for our longer limbed customers. If you have any questions at all about how your gi will fit, get in touch with Scramble. Don’t forget to check out our Trustpilot reviews – almost all of them five star.